After five long years after SMART and Globe launched the country's first LTE networks, PLDT-owned Sun Cellar was able to finally catch up. Yes, starting this month of October, Sun prepaid subscribers may now be able to access PLDTs LTE network promising up to 42Mbps of mobile internet speed. Sun LTE now available for prepaid subscribers. Long Term Evolution or LTE is a 4G wireless connection technology capable of transfering data at a very fast rate, as fast as ~300 Mbps. Here in the Philippines, PLDT promises speeds up to 42Mbps. Sun Cellular prepaid and postpaid subscribers who wants to access the LTE network can go to the nearest Sun shop. 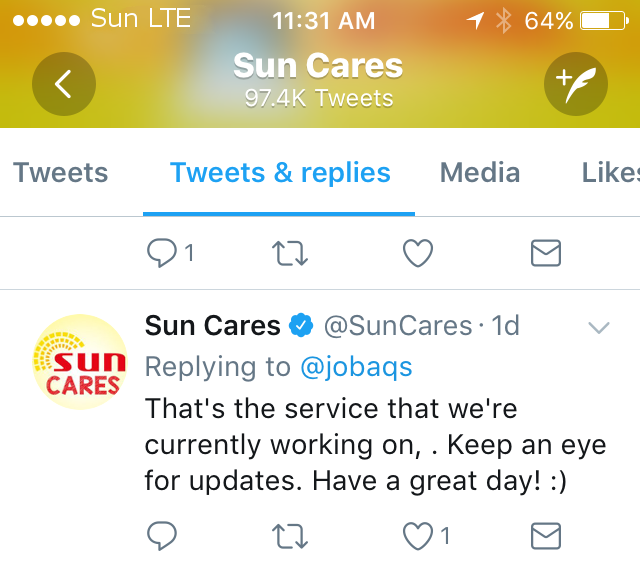 Sun will upgrade your sim cards for FREE without changing your number. Just go to the nearest Sun Shop, get a priority number and wait for your turn in the customer service section. You will need to surrender your old SIM Card and fill up a document. Along with this, LTE capable SIM cards can avail of Sun's new LTE promo: Sun Big Time Data 70. This will provide 1GB data, unlimited text to all networks, 30 minutes calls to Sun for 70 pesos, valid for 7 days. To register, subscribers need only text BDATA70 to 247. Did you find this article helpful? Please hit the share button above and below this page.